Abbie prepares Kris Jenner for her photoshoot! 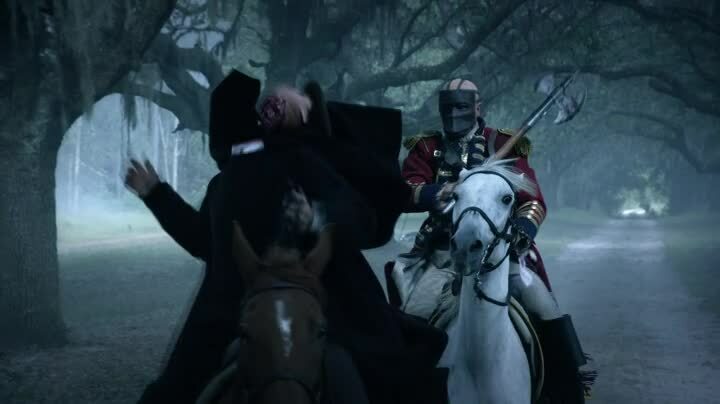 Pop the corks and pour yourself a big bubbly glass of crazy awesome, because Sleepy Hollow has raised the bar on how to make awesomely entertaining shows out something that sounds ludicrous! Case in point is the latest episode – “The Midnight Ride“. We begin with Paul Revere’s Midnight Ride on April 18th, 1775, but did you know he was chased by He Who Would Be the Headless Horseman? Also the Headed Horseman axed the crap out of most of Revere’s fellows. Sleepy Hollow is the bomb! 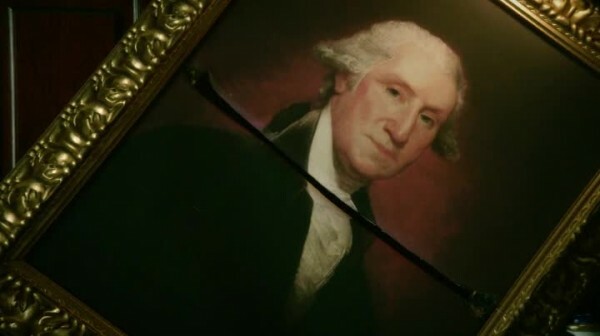 This historical tinkering isn’t new for Sleepy Hollow, but as they’ve embraced their new mythology for how the Revolutionary War was just one battlefield for the Secret War Between Good and Evil, the historical events will become more entwined into this mythology. Just last week we learned that the Freemasons (of which Ichabod is one, of course!) 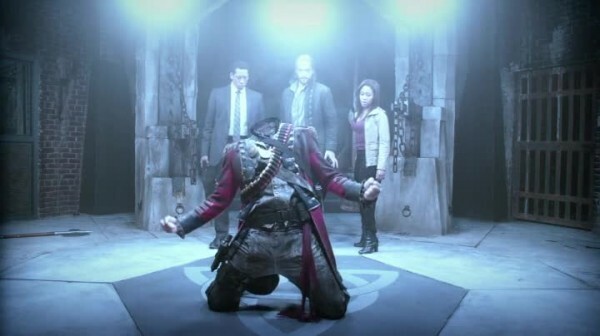 are secret heroes, and this battle has just been on pause for a bit until Ichabod and the Headless Horseman woke up. After a few weeks of reprieve, the Horseman is back, and he wants his head! Thus, everyone prepares for battle, Abbie stocking supplies in Sheriff Corbin’s cabin (where Ichabod lives), and Ichabod marveling at her bulk food purchases. He also mocks her for buying water and becomes disgusted with the pollution in modern society. 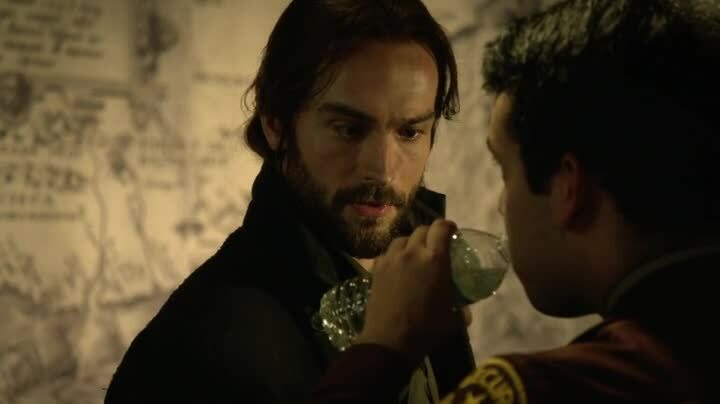 If anything, this episode has opened the floodgates for Ichabod fish out of water scenes, more happen here than in all other episodes prior. It seems like it would be overkill, but they all fit in very well with the tone. Ichabod is meeting with the Freemasons to discuss Headless Horseman weaknesses (remember: no girls allowed at the Freemasons!) while Abbie is not meeting with them because of said rule. Also they’re meeting at night for some reason despite the fact the Headless Horseman is only active at night (sunlight can kill him!) If you think this means there will be a slaughtering happening soon, you are correct! Detective Luke Morales scores coffee with Abbie tomorrow evening. He’s ordered to “temper expectations, please” by her as she leaves. And someone is watching from the shadows! Looks like someone hasn’t been flossing! Obviously it’s dead but not dead Officer Andy Brooks (John Cho) as he was seen in the brief synopsis before the episode began. 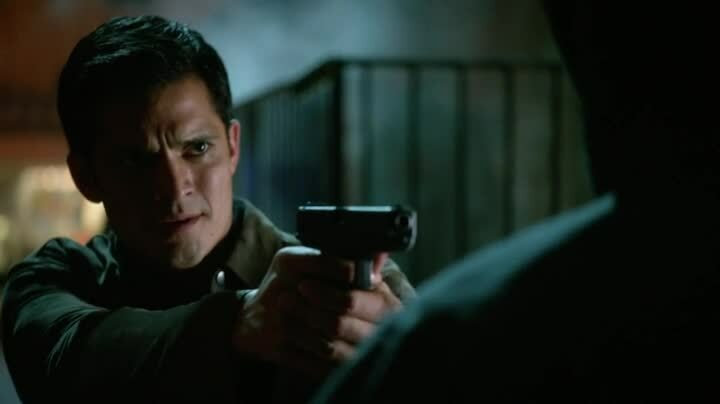 And it is, he’s now partially rotting (but covering it up) and uses super speed and special effects voices to warn Morales away from Abbie, declaring only he can protect Abbie from the end of the world and Morales needs to pick a side. As you can imagine, Morales is freaked out. Ichabod leaves a charming voicemail message on Abbie’s cell phone before he heads to the Freemason club meeting, but everyone there is now sans head, the Headless Horseman riding off with a big bag of heads. Captain Irving is all “This is a cult ritual suicide because we got no proof of a Headless Horseman!” Yes, he’s still covering it all up even though he’s seen stuff. 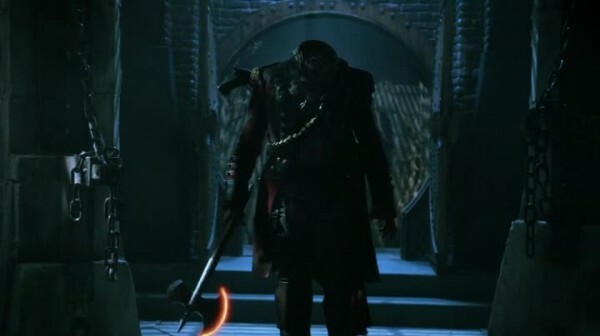 Ichabod figures out the Headless Horseman came to find his skull, as the Freemasons usually have artifacts. It’s true, I saw it in National Treasure. 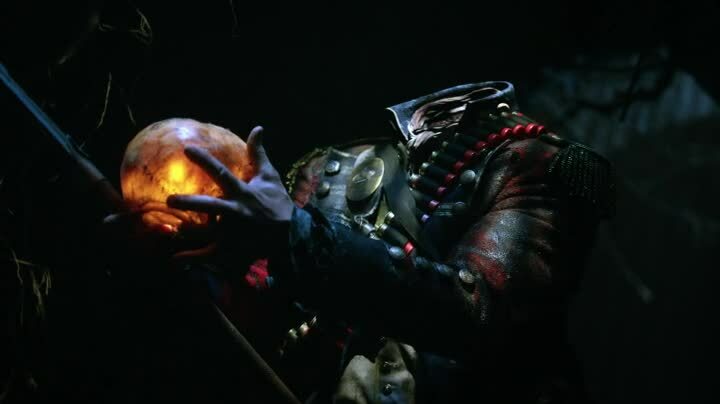 The thing to do to stop the Headless Horseman is to destroy his skull! 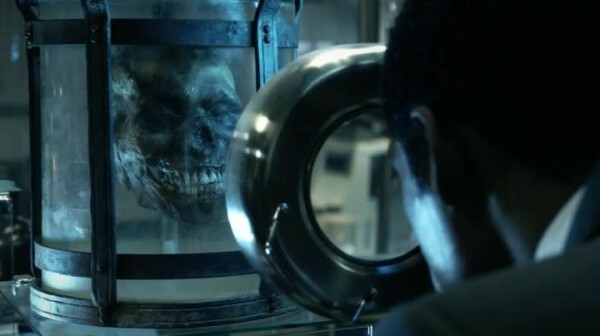 Captain Irving has hidden the skull in a special lab to keep it away from prying eyes, so he goes to retrieve it by himself. 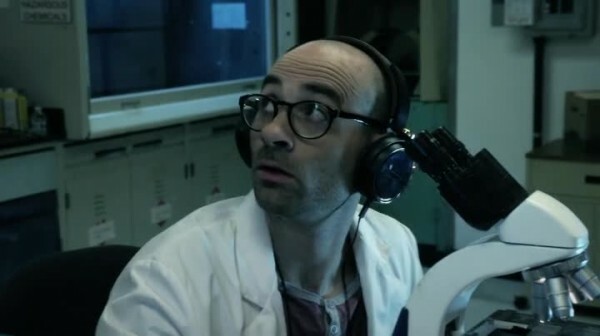 Meet Paul Short (Vince Pisani) the goofy scientist guy at the Fish and Wildlife lab that is examining the skull, determining it has no DNA and he can’t figure out how old it is. But the Headless Horseman also comes to the Fish and Wildlife lab. RIP Paul, gunned down by a Headless Horseman. This is the first time Captain Irving has seen the Headless Horseman, and you can imagine seeing your worst fear that all these crazy stories you’ve been seeing bits and pieces of evidence for are suddenly true, and now it’s killed your friend and is tossing an axe at your head! Irving ducks in bullet time, but a stuffed crow gets beheaded! The Headless Horseman beheading random things is a running joke, and I like it! Orlando Jones is awesome portraying an obviously freaking out Captain Irving, who is also keeping professional enough to shoot back at the Headless Horseman and grabbing the head and escaping. Captain Irving is now is all like “GAAAH!” but he can’t tell anyone what really happened at the lab because all the lab cameras cut out right as the Headless Horseman arrived. Thus Captain Irving is 100% officially in the secrets club with Abbie and Ichabod. So let’s destroy the skull. Skull destroying montage! 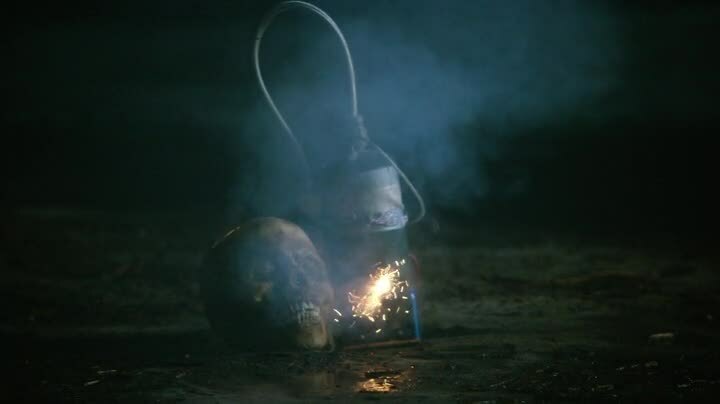 Abbie and Ichabod try a bundle of methods to destroy, smash, crush, burn, chainsaw, incinerate, and explode the skull, all of which fail as the Headless Horseman’s skull appears indestructible. Ichabod flashes back to just before the ride, he was guarding Sam Adams and John Hancock in their safe house (the Hancock-Clarke House), and saw them give orders to Paul Revere. Orders in a manuscript that had a six-pointed star on it. Thus, Paul Revere had a manuscript that has Headless Horsemen weaknesses in it, was what he was secretly carrying in addition to the warning about the British regulars, and is probably what the Freemasons had before the Horseman relieved them of their noggins. Abbie and Ichabod go to a local colonial museum that has the copy of the book Revere had, and Ichabod is greatly upset over the apocryphal teachings by the tour guide. He rants about water then yells at the tour guide about what really happened until Abbie drags him off as her unmedicated cousin “Steve”. Poor Ichabod’s about to lose it! Good news, bad news time. Bad news: The manuscript is on loan to London! Ichabod is sad because that’s a three month ship ride. I love how Abbie just skips over that statement without missing a beat, and delivers the good news: The manuscript is online! “That is wildly inappropriate!” He then slams shut the laptop when a webcam opens up and a woman starts talking to him. 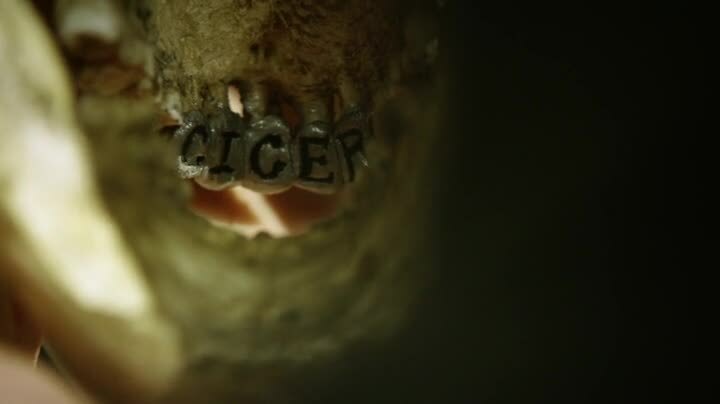 He does figure out that the password was engraved on the teeth of the Headless Horseman’s skull by Revere. Because, of course it was! The code says you can’t kill death, but can trap it. So that’s what Ichabod plans to do. But they need a witch to turn the moon into the sun…until Abbie says that UV lights are a modern sun! I really enjoyed this conversation, because I was waiting for slavery to be brought up beyond the two lines during “Pilot”. The large amount of black cast members could have lead to the whole subject being dealt with idiotically, but instead it is brought out in the open, and Ichabod forced to admit that actions weren’t ideal. As some of these slave-owning founding fathers are being used by this series as long-dead heroes, bringing up all aspects of their lives is fair game and should be done. It also helps humanize the founding fathers, who have become too deified by certain elements in the States. With the religious influences on Sleepy Hollow, this is another thing that could be handled terribly, but isn’t. 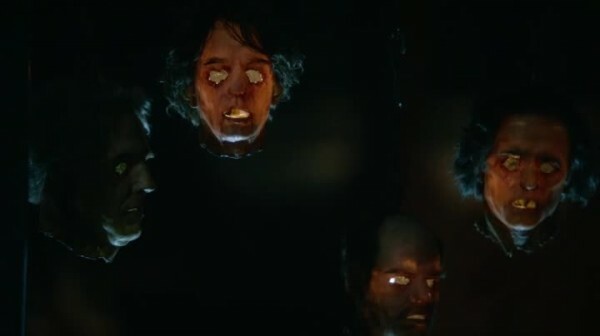 The heroes play chicken with the Headless Horseman’s head, each one holding a glowing skull, while lots of other growing skulls line the sewers. The Horseman begins stomping and smashing and trying to slice the heroes. Which head is real, and which is just a screaming Halloween decoration? They lure the Horseman into a room and flood it with UV lights! The Headless Horseman begins smoking, and they handcuff him in shackles. Then the episode just ends, like that! Facebook Founders of the Living Dead! Hey, that’s too easy! It was cool, watching their tricks, but now that he’s caught in a tiny room, what are they going to do with him? 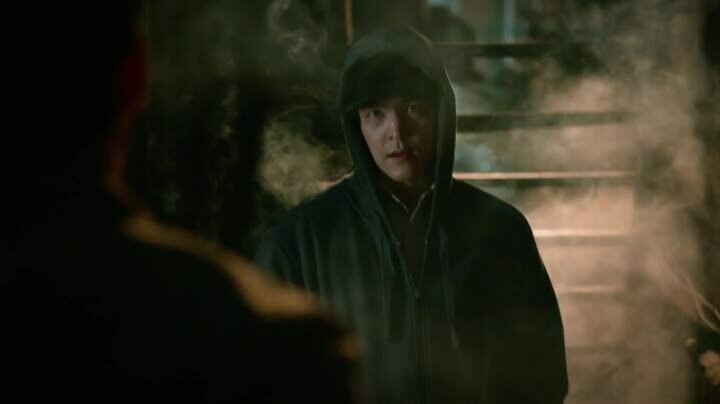 Will he escape during the prologue of next week’s episode? Will they keep him locked in a room with lights until someone switches off the power then he escapes? Or will the Headless Horseman get a cool tan and go to Cancun for Spring Break 2014? This mystery will be solved…when the show gets around to solving it! This is my favorite episode yet, it did a great mix of the past elements, the mythological elements, and the goofy elements, but also kept the danger and tension high enough you weren’t sure if certain minor characters were going to bite it or not. Andy Brooks gets some development, and who knows what Morales is going to do next week. I’m glad the writers realized making Irving the disbelieving authority figure every week was going to get too unbelievable soon and clued him in. It also looks like the writers opened the floodgates of the past guy in the future jokes they couldn’t use in the first six episodes. Probably got a few more that will be loaded with them before things calm down again. Until next week, keep it hollow! How come every woman I date becomes involved with the Biblical Apocalypse??? Hi! Don’t get too attached to my character! Use a reusable bottle next time, or the Headless Horseman will get you! NOOO! The Star Wars Prequels on Infinite Loop!